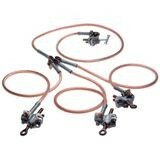 4-LEG GROUNDING SET | Tallman Equipment Co., Inc. This four-leg grounding set is for use on live-front switches and transformers. 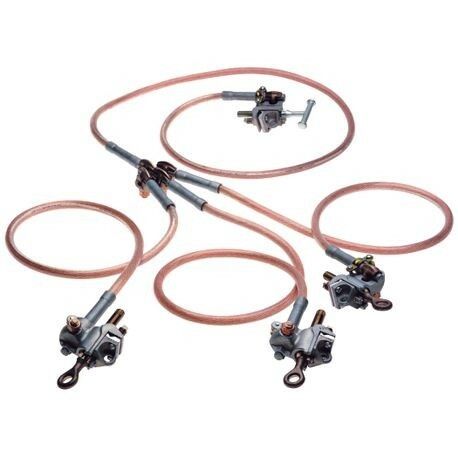 each ground cluster consists of a four-way bronze terminal block, (1) 6 ft. and (3) 4 ft. lengths of 1/0 clear-jacket copper cable with aluminum ground clamps on each end. The single 6 ft. leg has a T-handle flat-jawed ground clamp (G336345SJ) and the (3) 4 ft. legs each have a flat-jawed ground clamp with a bronze eye screw (G33633SJ). The optional storage bag is part number T6000865. Fault current rating is 21,000 amps for 15 cycles of 15,000 amps for 30 cycles.